CarGurus has 18,152 nationwide Sierra 2500HD listings starting at $3,675. If you want to see what constant vehicle improvement looks like, take a gander at the heavy-duty truck segment. Every year, manufacturers like Chevrolet, Ford, GMC, and Ram introduce new versions of their heavy-duty trucks or make massive updates to stay one step ahead of the competition. For 2017, GMC hopes its changes to the Sierra 2500HD can keep it ahead of the recently redesigned Ford F-250 Super Duty. The Sierra 2500HD’s exterior was fully redesigned in 2015, and for 2017 the model retains its large grille, square headlights, large bumpers with tow hooks, and flared fenders. If you choose a diesel engine, you’ll get a new hood with an air scoop, which is part of a new air intake system for the diesel engine to provide additional cooling. For 2017, the Sierra 2500HD will be offered in regular, extended, and crew cab versions. A 6.5-ft bed is available for extended and crew cabs, while an 8-ft bed is available for all cabs. Wheels range from 17-inch steelies to 20-inch polished aluminum ones. GMC uses the same interior design across the entire Sierra family, so whether you’re going from a Sierra 1500 to the 2500HD or vice-versa, you’ll feel at ease with the same control layout. The truck’s interior has seen a noticeable improvement with the addition of more soft-touch fabrics and durable plastics. The instrument cluster is decked-out with all the necessary gauges, including temperature gauges for the engine and transmission. Depending on the cab and trim, the Sierra 2500HD can seat up to 6 people. The Sierra 2500HD is available in four trim levels. The base Sierra trim comes equipped with high-intensity-discharge (HID) projector-beam headlights with LED lighting, an Eaton automatic locking rear differential, a chrome front bumper, a locking tailgate, vinyl floors, cruise control, a tilt steering wheel, and a 4.2-inch AM/FM radio with a USB port and Aux jack. The SLE trim level adds cargo-bed LED lighting, an easy-lift tailgate, 17-inch machined-aluminum wheels, a 4.2-inch driver information screen, Bluetooth, carpeted floors, an 8-inch touchscreen with GMC’s IntelliLink infotainment system, a reversing camera, and GM’s OnStar telematics system. The SLT trim level features 18-inch chromed-aluminum wheels, heated front seats, dual-zone climate control, power-adjustable pedals, and a theft-deterrent system. Rounding out the Sierra lineup is the Denali, which adds 20-inch chromed-aluminum wheels, heated and ventilated front seats, a heated steering wheel, navigation, a Bose audio system, and parking sensors. New for 2017 is the All-Terrain X package, created as an upgrade to the Sierra 2500HD SLT trim for those who want to explore the wider world in their heavy-duty truck. The All-Terrain X package features a Z71 off-road suspension with Rancho shocks, an underbody shield for the transfer case, a set of Goodyear off-road tires, and 18-inch wheels finished in black. The exterior boasts a body-color grille surround, side-steps, a spray-in bedliner, and a sport bar. The base engine for the Sierra 2500HD is a 6.0-liter Vortec V8 with an output of 360 hp and 380 lb-ft of torque. For 2017, GMC introduces a new 6.6-liter Duramax turbodiesel V8 that produces 445 hp and 910 lb-ft of torque—an increase of 48 horsepower and 145 pound-feet, respectively, over the previous Duramax engine. 90 percent of the new Duramax’s torque is available between 1,550 to 2,850 rpm, making it a perfect tool for towing. The Vortec V8 carries a maximum rating of 3,534 pounds for payload and 14,800 for towing, compared to the Duramax V8’s 3,204 and 18,100. 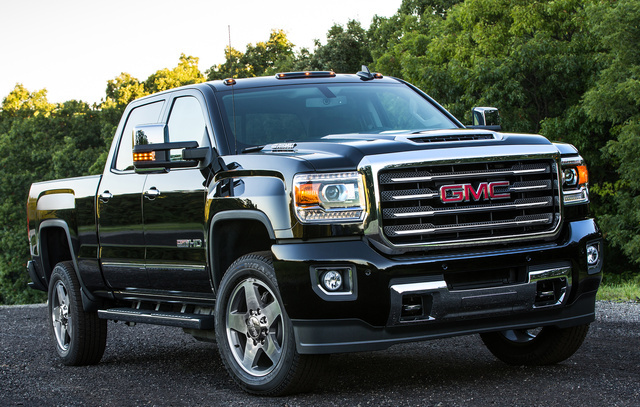 For 2017, GMC has added the new Teen Driver system to the Sierra 2500HD. Teen Driver allows a parent to set up a special key for their teen that sets limits on speed and audio-system volume and mutes the audio until everyone buckles up. Teen Driver also provides reports on how fast and far the vehicle traveled and how many times the antilock brakes and stability control were engaged. Other safety features for the Sierra 2500HD include a full set of airbags, traction and stability control, and trailer sway control, while forward-collision warning and lane-departure warning are available options. Pricing for the 2017 Sierra 2500HD starts at $37,320. What's your take on the 2017 GMC Sierra 2500HD? Users ranked 2017 GMC Sierra 2500HD against other cars which they drove/owned. Each ranking was based on 9 categories. Here is the summary of top rankings. Have you driven a 2017 GMC Sierra 2500HD?